There are duplicate transactions, or transactions have been accidentally deleted. 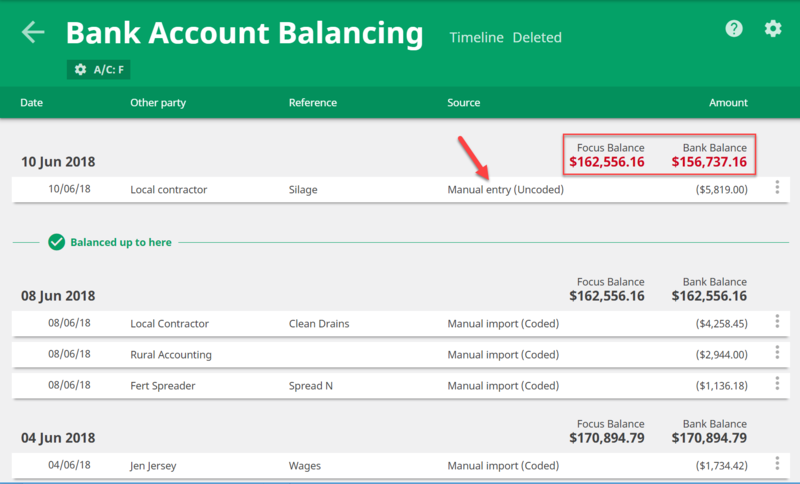 In the example below, the account is unbalanced because there is an uncoded transaction. Once it has been coded, the bank account will be balanced. In the meantime, it will not appear in GST returns or in your working plan until it has been coded. What else can cause an unbalanced account? You may have created a transaction in Cash Manager Focus that doesn’t appear in your bank account. For example, you want to claim the GST for a business related item that was paid for from your personal account. The Balancing tab makes it easy to pinpoint when the account may have become unbalanced, as the account balance in Cash Manager Focus is reconciled to your bank account's balance each day. However, we suggest you check the opening balance for the bank account to make sure it's been correctly recorded. To do so, go to Settings - Bank Account. Next, remove any duplicate transactions that don't belong in your farm business. To reinstate any deleted transactions, go to the Balancing tab. Click on the Deleted tab. Locate the transaction, click on the three vertical dots and select Restore transaction.